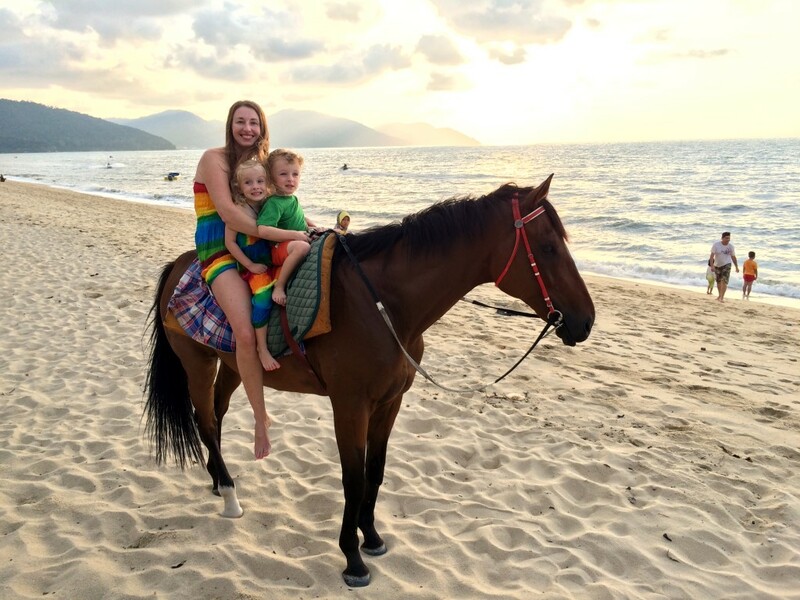 Penang is a great spot for family travel and there are dozens of awesome kids activities in Penang. 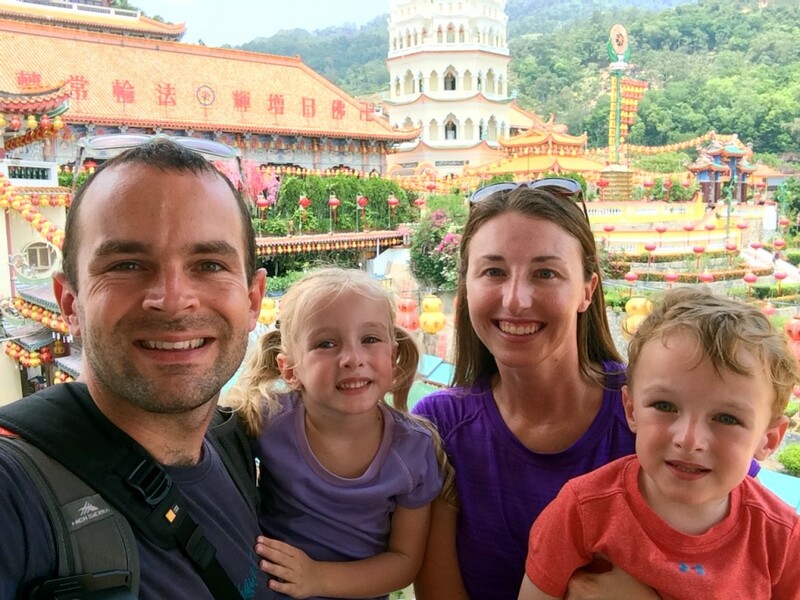 We spent about 3 weeks exploring the island, including several days with Nana and Papa visiting, and we found tons of fun Penang attractions and things to do as a family. 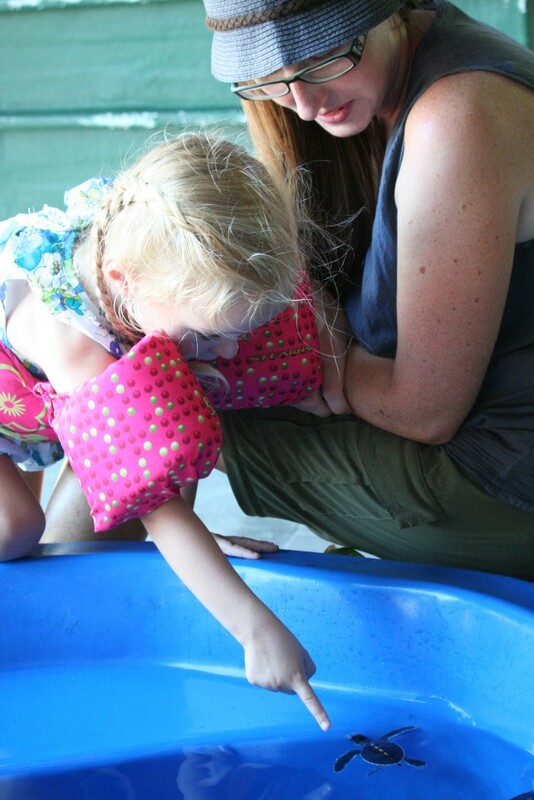 There are some really excellent lists of Penang kids activities out there (like this one from our friend Sharon). We had a blast in Penang and wanted to share our own list of things to do with kids in Penang too. 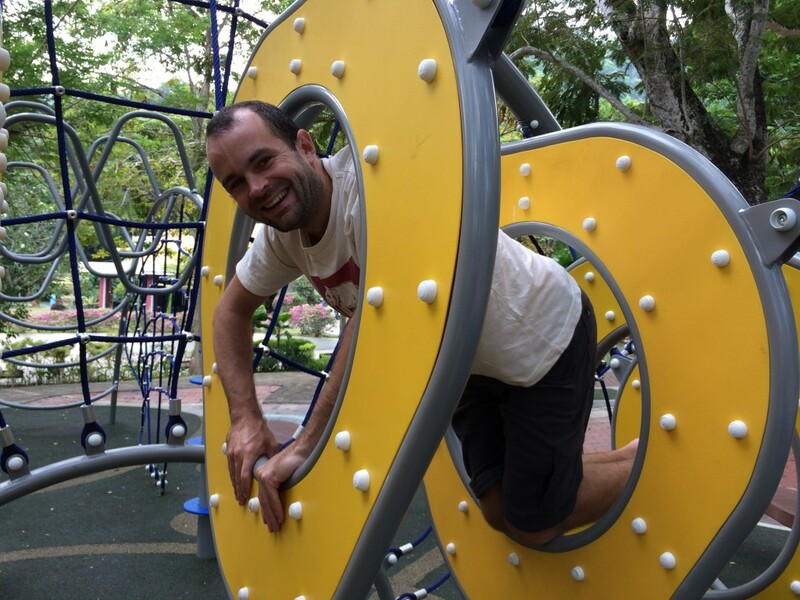 Penang Municipal Park is one of the coolest public parks we’ve been to. This was definitely our favorite Penang kids activity. Not only are there several big playgrounds, but also a series of cascading swimming and splash pools to cool down in. The pools are clean and clear, and surrounded by fountains for kids to play in (like in the feature image at top of this post). The pools and two playgrounds are near each other in one part of the park. In this area there’s also changing rooms and bathrooms, as well as a snack stand where we got our ice cream fix. This part of the park is lush with lots of shade. We got lucky one day and a troupe of monkeys made their way through the area too. You Park not just for youth. Down the road a bit there’s a separate area with another giant playground specifically designed for kids in wheelchairs. This playground is quite new looking and really nice – our kids loved running up and down the ramps. The one downside is there is no shade, so bring water, hats, and sunscreen. Penang Municipal Park is free to enter. 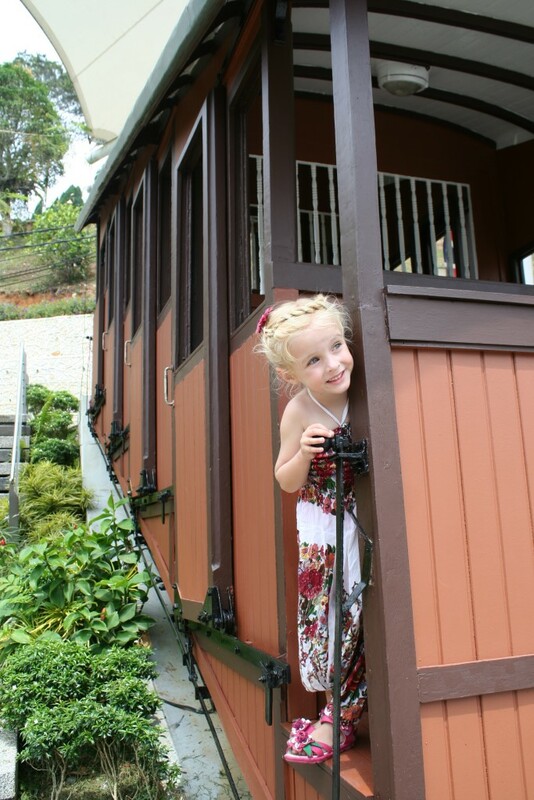 For our kids anyway, the funicular ride up Penang Hill was probably the best part of this activity. At the top there’s also a small playground, a Hindu temple, a mosque, a couple restaurants, and various other minor attractions. 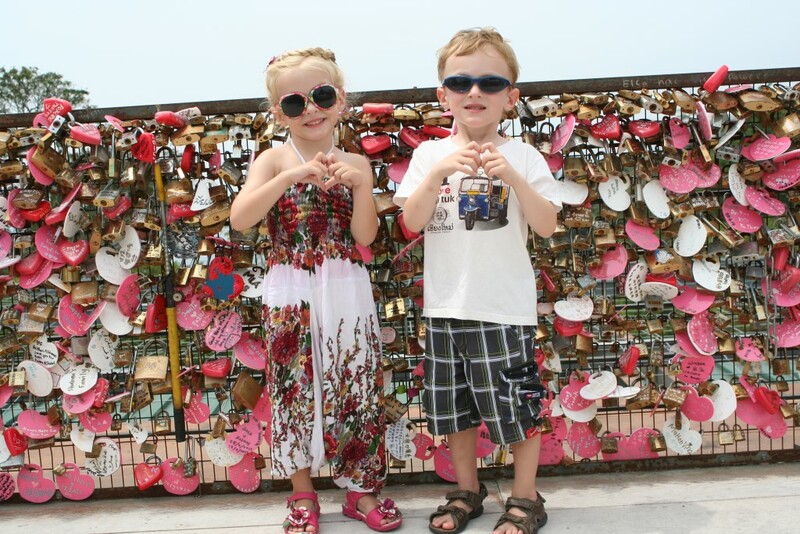 Posing at the wall of love locks. We had lunch at Cliff Cafe which was fine and reasonably priced. It’s basically a food court with several options including both Western and Malay food. We followed that up with a stop at Bellevue Hotel where they have a small aviary and gorgeous gardens. They talked us into staying for a quick tea which was worthwhile for the view alone. The funicular cost 30 Ringgit ($8) roundtrip per adult, kids were free. Tip: angle for the seats near the top (going up) or bottom (going down) of the funicular car for the best views. Posing on an old funicular car at the top of Penang Hill. Technically this one isn’t really in Penang, but it’s easily reachable from the island and makes a good day excursion. We drove to Bukit Merah ourselves and from Batu Ferringhi it took about an hour and a half each way. Orangutan Island is part of the larger Bukit Merah Laketown Resort. The resort as a whole also includes a water park, “ecopark”, games, restaurants, and two hotels on the shores of a large lake. The Orangutan Island portion is a sanctuary in the middle of the lake designed to provide a safe home for orangutans, and allow scientists to study them. You can take a little ferry from the dock at the Laketown Resort across the lake to visit the island (72 Ringgit, $20 for all of us). 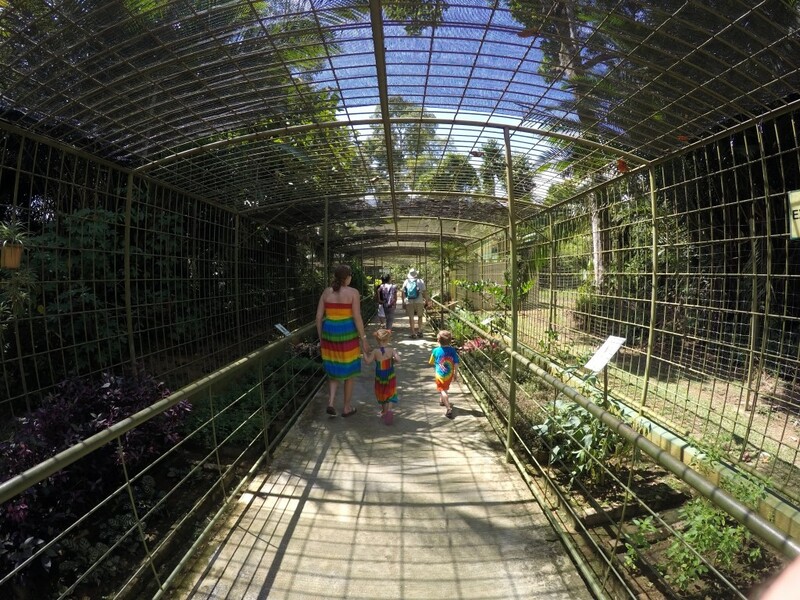 Once on the island you are guided into a cage tunnel to see the orangutans. On this island the orangutans are free and the humans are caged. We saw several of the fuzzy orange monkeys and found them really endearing. One in particular was shy, hiding beneath a leafy branch when we came near, but peeking out occasionally to see the crowd. After returning to the main resort area we ate in the food court area. Options here were a bit limited if you didn’t want local (very local) Malaysian food so perhaps think about bringing food if you’re particular. There’s also a café with more western fare, but it’s expensive and Nana reported not very good. We then spent the afternoon at the waterpark (70 Ringgit, $19 for all of us). While a bit run down by western standards it was a blast and a great way to end the day. There’s a big kids play area with smaller slides and fountains to splash around in. There are also plenty of bigger slides for adults, including a completely insane U-shaped tube slide that is pretty much guaranteed to give you whiplash. Kat had a big audience of locals laughing at her for this one, but none of the girls in their group dared try it. Loud and proud! Monkey Beach is part of the national park at the north end of Penang island. To reach Monkey Beach you hire a boat at the national park entrance. Negotiate the rate directly with the boatman. We paid 160 Ringgit ($43) for the whole boat for the day. You will also need to register with the national park office (no charge). Having your own boat is awesome because you can set the itinerary. We ended up hanging out on Monkey Beach for a long time but it was not problem because no one was rushing us back. This is perfect for traveling with kids. 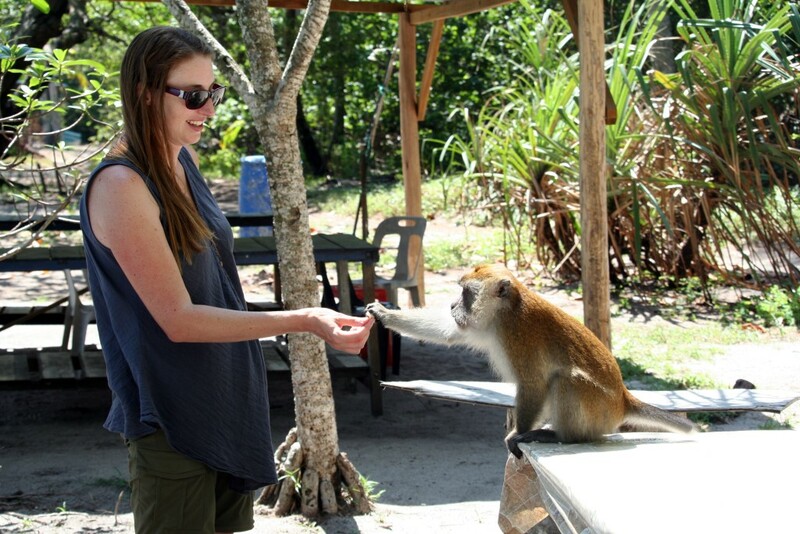 Monkey Beach is a nice piece of white sand that also happens to have a population of curious monkeys that come down from the jungle to snag tourists’ food. Most of them were friendly enough, though some got a bit aggressive so keep alert. They’ll go after food on your table or in your bags if you’re not paying attention. 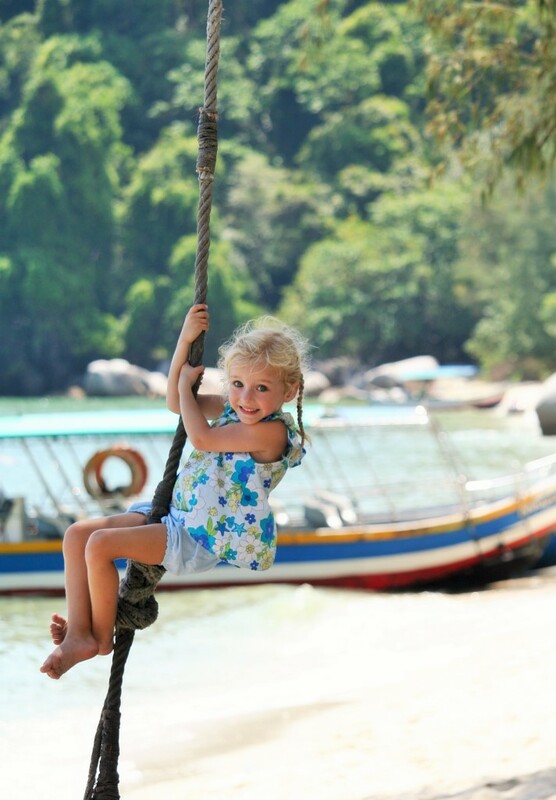 Enjoying the rope swing at Monkey Beach. We saw a ton of jellyfish in the water on the way to and from Monkey Beach, but our boatman told us it was safe to swim at the beach itself. It was hot and the water beckoned so we gave it a shot. While the water was quite cloudy we didn’t encounter any jellyfish. As part of our boat trip we also stopped at “Meromictic Lake”, which was almost completely dried up during our visit. When it’s not dried up it’s composed of layers of fresh and salt water that do not mix. Not far from the lake we also stopped at a sea turtle sanctuary. This was a major highlight for the marine biologist (Papa) and his protégés (Kat and the minis). Besides some displays on the walls there were several tanks with live turtles. The best of these was a small pool right in front with a bunch of just hatched baby sea turtles. There’s also a beach at the turtle sanctuary, but there are TONS of jellyfish here. So definitely no swimming! Teluk Bahang Forest is a fun Penang kids activity that’s similar to Penang Municipal Park, though honestly not quite as nice. 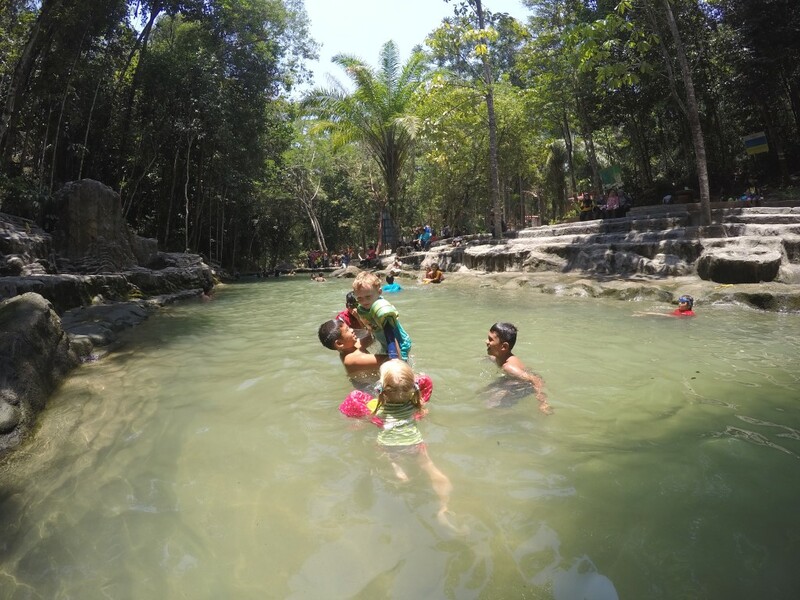 There’s a small playground and several swimming pools carved out of a natural creek. A main difference here is that since it’s a natural creek the water isn’t treated. There are signs warning against waterborne illness so keep that in mind. We swam and didn’t have any problems. Local kids were fascinated with Jasper at Teluk Bahang Forest. A big benefit of Teluk Bahang Forest, if you’re staying in Batu Ferringhi, is location. Just an easy 10 minute drive west from Batu Ferringhi, it’s a lot easier to get to than the Municipal Park. Teluk Bahang Forest is free to enter. Aurora and Jasper have certainly had their fill of temples during our travels. In general they’re not the biggest fans, but mostly still enjoyed this one. 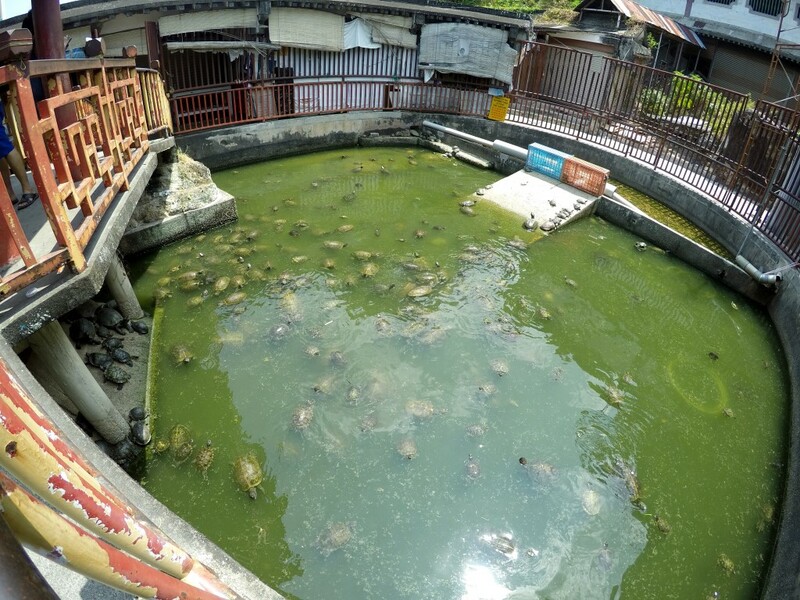 The highlights for them were climbing the steps to the top of the large pagoda, the funicular ride up to the giant Kuan Yin (Goddess of Mercy) statue (12 Ringgit, about $3 for all of us), and the turtle pond at the base of the temple complex. At the turtle pond you can pay a nominal fee for some bunches of leafy vegetables to feed to them (1 Ringgit, about $0.25 per bunch). There are dozens of turtles and it’s really entertaining to watch them clamber over one another to get at the food. There’s a decent restaurant right in the basement of the temple where you can get an inexpensive lunch. We got more than enough food for the 4 of us and it cost under $6. It costs 3 Ringgit (less than $1) to park at the temple. We spent the better part of a day roaming the streets of Georgetown checking out the awesome street art. We wrote a post about it, including a bunch of photos, here. We stumbled into this Penang kids activity on our way to dinner one night. After parking our car in a lot near the beach we decided to walk over and check out the sunset. Just as we stepped on the sand a man with a horse offered us a ride. Kat was able to ride with both kids which was cool, and made for some great pictures. The horseback ride cost 40 Ringgit ($11). Ok so this isn’t specifically a Penang kids activity, but it’s fun. We stopped at a little stand in the Batu Ferringhi night market after dinner and got family “ink” done. The henna is cool because it just lasts a few days (supposed to be couple weeks, but it seemed to wear off the kids faster). You have to be careful with squiggly little ones though – before the ink dries it’s very easy to smudge, and the smudges can’t be erased. Tattoos for the 4 of us cost 35 Ringgit ($10). Aurora waiting patiently for her tattoo to dry. This is a classic Georgetown attraction and you shouldn’t miss it with kids, especially slightly older ones. While Aurora and Jasper were a bit young to get the history and architectural interest here, they did find it interesting to see people’s houses out over the water. It’s free to walk around the jetties. 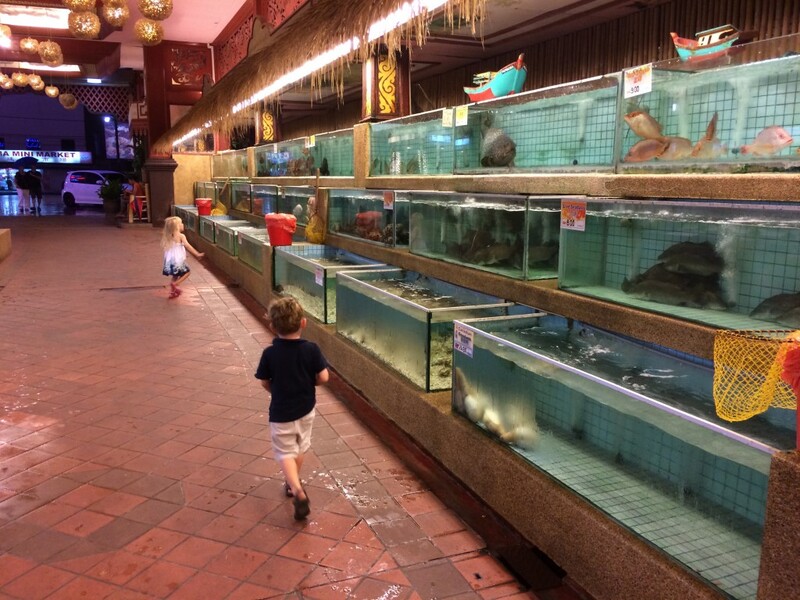 This restaurant on Batu Ferringhi beach serves up delicious (and expensive) seafood, but the big reason it qualifies as a Penang kids activity is the huge collection of tanks in the front where you pick out your dinner. Jasper and Aurora were both excited to the point of doing laps back and forth in front of the tanks, pointing out which aquatic delicacy they planned to order. The restaurant is huge, and open to the beach on one end. So the kids were able to run around a bit and even play on the beach while we waited for our food. Nana and Papa treated us to this one (thanks guys!! ), so we don’t know the cost, but it’s definitely a splurge. If you’d rather not see your dinner swimming around before it hits the grill you might prefer one of the awesome Penang hawker markets. These are basically food courts with a variety of stalls from which to pick your meal. You’ll find mouthwatering Malaysian, Thai, Indian, and more. Our two favorites were Long Beach in Batu Ferringi and the one on Gurney Drive, pictured below, near the Gurney mall (we parked at the mall). At Long Beach, if you sit in the back left corner by the river you may get to see monitor lizards along the banks or swimming in the water. Long Beach is also a popular place for expats and we met some fellow family travel bloggers for dinner one night. It was quite a scene with all of our kids running laps around the tables, but no one minded and it allowed the parents some time to relax and talk with other adults. Either Gurney or Long Beach are great for families with kids because it’s no problem to be loud and everyone can choose his or her own meal. 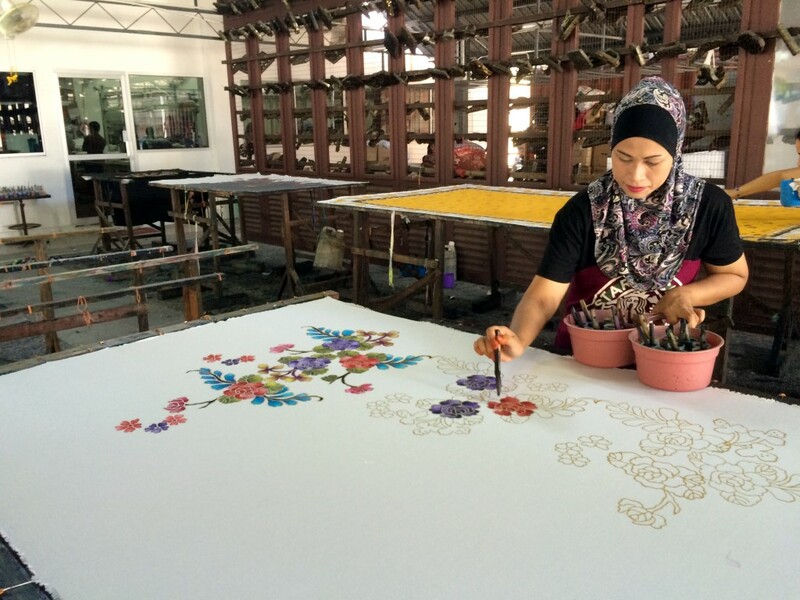 The Batik Factory is just a short diversion, but worth a stop if you’re driving to the national park or Teluk Bahang Forest. You’ll see signs along the road. At first glance it’s just a store with racks upon racks of gorgeous batik fabrics made into sarongs, skirts, shirts, and more. There are also batik art pieces hanging on the walls. But the reason to stop is the quick tour of the workshop in the back where they are actually making the patterned fabrics. Using melted wax and colorful dyes, skilled workers transform plain cloth in front of your eyes. It’s a really cool educational experience, and only takes a few minutes. 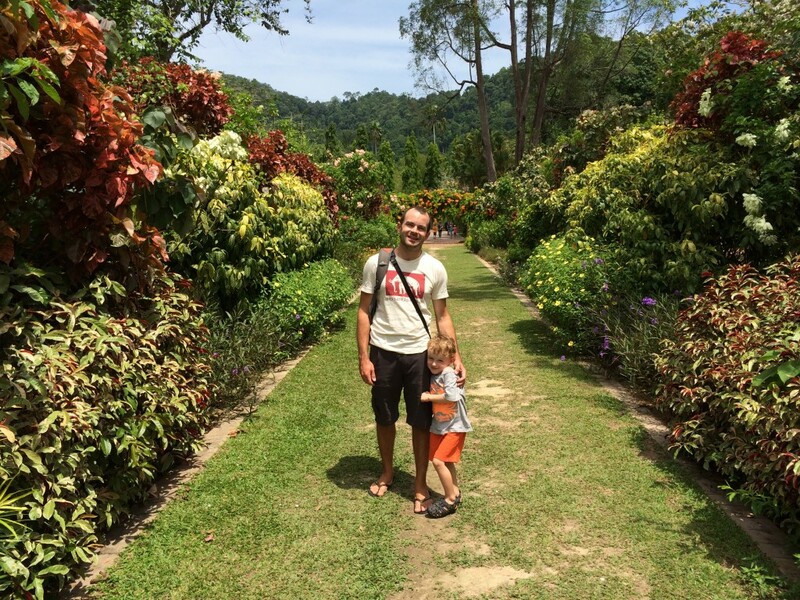 While not the most amazing botanical gardens we’ve seen, the Penang version was still a fun stop for a couple of hours and a good kids activity. Most of the displays are compartmentalized in a series of greenhouses or caged areas. The easiest way to see all of the displays is by hiring an electric tram as they are quite spread out. It’s 10 Ringgit (under $3) per adult for the tram ride. Kids are usually 3 Ringgit, but we negotiated ours for free. In addition there’s a peaceful Japanese garden by a gurgling river, and a nice formal flower garden. There’s apparently a shooting range adjacent to the Botanical Gardens parking lot, and the gunfire certainly diminished the tranquility of some parts of the gardens. We don’t know if it operates every day. You can grab lunch at the small café on the opposite side of the parking lot from the shooting range. We had some delicious Indian food (4 Ringgit for chicken, 2 Ringgit for noodles), though the proprietor told us they only make the hot food on Saturday and Sunday. There are some other food stalls there that may be open other days but we were there on a weekend so we’re not sure. As you can see there’s tons of activities for kids in Penang. It’s one of the more family friendly places we’ve traveled in Asia. Find an awesome Penang hotel on Agoda. 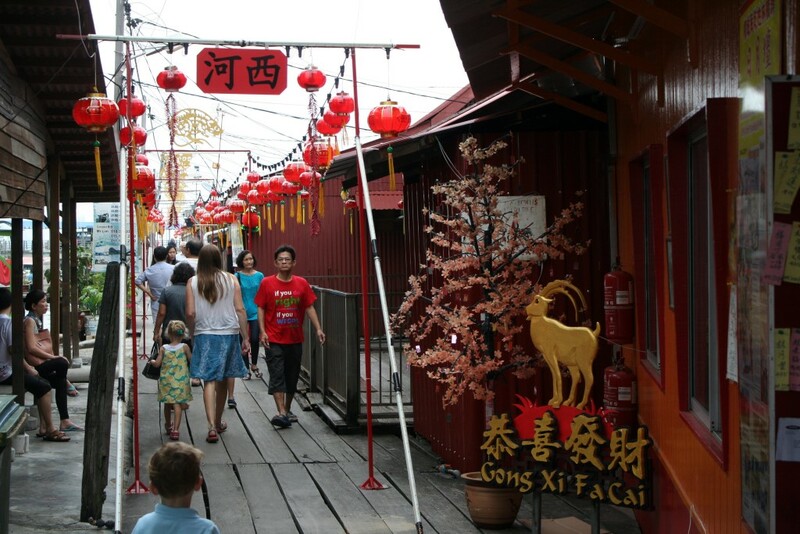 Have you tried other family activities in Penang? Let us know in the comments! Hello? Are You Guys Still in Malaysia? I am having a ball following the GodChildren and the Great-Godchildren in their travels. What an amazing idea to chuck everything and go on this FASCINATING ADVENTURE. A lot of us are relishing the vicarious thrill of it all. Keep us all in the loop. We are loving it. As for the “LOUD AND PROUD” KATE…….. Whatever happened to that shy, introverted lady we all once knew and loved???????????? Oh, I’m sorry, that was in a former life!!!!!!!!!!!!!!!!!!!!!!!! Ha! Thanks Richard! Trust me – I didn’t sign up for the audience – they just came to gawk and laugh! It was a quite a sight (and I screamed loud enough for the rest of the park to hear). But yes – my shy days are over. Aurora plays shy now too – but behind closed doors she never stops talking!! Try horseback riding at Countryside stables in Balik Pulau. A lot cheaper than B. Ferringhi and the kids can feed and groom some of the horses there! Thanks Jim!! We’re having a blast. Social media is incredible, I’m grateful for the opportunity to connect! Cheers!